Soft, decorative balls of fluff. One of our most popular craft items! For school, camp, home and parties. 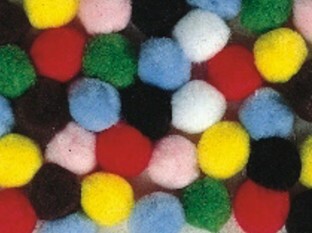 Pom Poms, 1". Soft, decorative balls of fluff. Pack of 100 in assorted colors. For school, camp, home and parties. You can use it on anything such as crafts greeting cards etc. Children love being creative with these. The different sizes help them to come up with lots of fun creations. Love these pom poms. These are just the right size and there is a good variety in the one pack for a reasonable price. Cheaper than buying them from the store. Used these at a kids craft station to make caterpillars. The poms were easily glued onto a clothespin and we also glued on wiggly eyes. The kids loved them! Good for all ages in art.